Balboa BP1500 - Revolution Series. 4.0 Kw Digital Spa Controller - Wireless iPhone Integration. Integrates with you iPhone, iTouch, Pad! The Revolution BP Series uses the most advanced spa technology including polymer high-temp corrosion resistant casing typical of materials found in the airline industry. This removes any chance of leaks that can damage the spa pack due to the harsh chemicals. A completely new lower power density energy efficient element has been added with extra vibration dampening to reduce element failure. The BP Series represents peace of mind and energy conservation. The Balboa Revolution incorporates a new compact low profile casing that offers more flexibility for mounting. This makes it easier to install and will replace almost any spa pack giving you more flexibility when replacing a spa pack. The BP Series uses M7 Technology which is simply the best spa pack technology on the market. Completely digital circuitry means less failure, more accurate heating range (+/- 1 degree F). And it now includes both a high range (80-104F) and a low range (50-99 F) operation. The Patented M7 Technology removes the need for pressure sensors and remote heat sensors common on other older spa packs. This unique technology allows the spa pack to be positioned in any location or direction (before or after the pump or before or after the filter). Although this spa pack can work at 120 VAC in which case it will produce 1.0 kW of heat, it is primarily expected that it will be used at 230 VAC (requiring 30-50 AMP service) and will produce 4 kW of heat. One or more auxiliary heater, each producing 4.0 kW or 5.5kW can be slaved to the unit if more power is required. It's union tail pieces (included) fit standard 2" piping or with reducers can be easily adapted to 1.5". Built in programmable features such a 12 or 24 hour filter cycle programming by duration or time of day , various power saving modes including standard, economy, and standard in economy mode, ozone suppression, clean up cycle, freeze protection, panel lock, temperature lock, standby mode for filter changes and sophisticated diagnosis and reminder measures are just some of the features. It also has the ability to select how much current will be drawn allowing a breaker as low as 30 Amp, yet still deliver the full 4.0 kW of electric heat. It has receptacles for the following. 1 x 2-speed pump1, 1 x 1-speed pump2, Ozonator, 12v Light. 1 x 1-speed pump1, 1 x 1-speed pump2, Circulation Pump, Ozonator, 12v Light. 1 x 2-speed pump1, 1 x 1-speed blower, Ozonator, 12v Light. 1 x 1-speed pump1, 1 x 1-speed blower, Circulation Pump, Ozonator, 12v Light. 1 x 2-speed pump1, Ozonator, 12v Light. 1 x 1-speed pump1, Circulation Pump, Ozonator, 12v Light. 1 x 2-speed 120v pump1, 120v Ozonator, 12v Light. 1 x 1-speed 120v pump1, 120v Circulation Pump, 120v Ozonator, 12v Light. 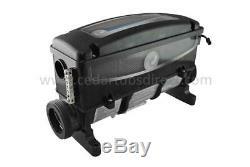 1 x 2-speed pump1, Circulation Pump, Ozonator, 12v Light. Setup 1-6 use 240v, pumps, blower and ozonator, although some field jumpers are available to mix 240 and 120 device. Connection for Audio/Visual components power (120 volt) is available as are connections to control auxiliary heater. 8.5" High x 18.4" Long x 5.8 Deep. Requires Balboa TL series panels and has connectors for 1 main panels and 1 auxiliary panels. Optional Wi-Fi Module for use with iPhone, iPad, iPod. 120 or 230 VAC ozone support (circ pump and ozone must have same voltage). High or Low current mode. The flow through heater tube must be a minimum of 20 USGPM if the heater is 4.0kW. This flow rate should be checked if your spa uses a small circulation pump such a Laing E14 or others made by Grundfos or Waterway Mighty-Might. These small pumps when used with 1 piping typically cannot produce this flow. MADE IN AMERICA not China! Works with the following Balboa Top Side Controllers. Balboa TP600, Balboa TP400, TP600, TP900. Y-Cable 4 PIN- PN 25657. Your #1 Hot Tub Parts Replacement Store! The item "Balboa BP1500- Hot Tub Heater-BP Revolution Spa Pack PN# 56125" is in sale since Sunday, June 5, 2016. This item is in the category "Home & Garden\Yard, Garden & Outdoor Living\Pools & Spas\Spas & Hot Tubs". The seller is "hot-tub-parts" and is located in Winnipeg, Manitoba.